I don’t think we are. Yes, we talk about using it a lot, discovering new technologies, and making existing ones more efficient. But we aren’t deploying all the technologies we have. Case in point: solar panels. We have the technology to drastically cut our reliance on traditional electricity production. In sunny parts of the U.S., homes can be powered entirely by solar panels that can fit directly on their roof. In less sunny parts of the U.S., such as my home state of Maine, they might still fully power a very energy efficient home, and even if not, they could provide a substantial portion of the energy said home would use, cutting down the need for a lot of the fossil fuel electricity we use. So why aren’t we using more of these? Well, I have some ideas on this. One is cost. It’s a big investment to make, around $20,000. This is a big investment for a homeowner to make, and a big one for the government to make if it’s subsidizing all the homes in the country, or even those below a certain level of wealth. Assuming about 160 million homes in the U.S. (from the last Census count), that would cost the government 3 trillion dollars to pay for everyone to get solar panels installed. A good middle ground right now is that some state governments, and I believe the federal government, do provide rebates and tax cuts to those willing to invest in solar power for their homes. Still, the cost is high, and these programs aren’t really advertised and pushed. Of course, in the long term, they usually do pay for themselves in savings, but realistically, not everyone can make the up front investment. Another issue, that I think plays a bigger role than cost, is that they don’t look nice. We make such a big deal about appearances in our culture that I think even if they were more cost efficient, many people wouldn’t adopt them even then. I’ve told friends that when I have my own place and the money to invest, I’m getting solar panels for my home. I’ve suggested others do the same for the long term savings. None of them cited cost as a reason not to do so. They all claimed that solar cells make a house look ugly. Honestly, this doesn’t sit very well with me. I’d say energy efficiency and renewable energy are a lot more important than how pretty the outside of the house is. Perhaps I’m just weird, but it seems like the substantial things are more important than aesthetics. I think we ought to try another method of selling solar panels. Since they’re such a large and important investment, let’s see a monthly payment plan… perhaps companies could charge the savings in utility bills each month, so the person investing pays the same amount monthly for electricity, but is also paying to own the solar panels eventually as well. When the solar panels are paid off, the person who had them installed owns them in full. This would make investing in solar panels much more reasonable cost wise. Perhaps the government could provide some kind of subsidy to companies willing to work with this arrangement, in addition to the people investing in solar. Seems like it could help promote solar a lot in this way. We’d still have to deal with getting people to accept the aesthetic issues, but I think this plan could help deal with cost very well. Of course, there’s also wind, water, and geothermal, and these seem to be gaining more traction, though there’s a lot more work to do. Some places do power themselves mostly on these forms of energy, since they happen to have the naturally occurring resources to make use of these kinds of energy. These forms of energy don’t require people to sacrifice appearances though, which is why I think they’re more popular. They’re certainly very useful, and we should promote these and other renewable energies as well. I do think solar has the greatest potential, since the sun shines just about everywhere, though obviously more in some places than in others. The arctic circle would have some special challenges, in that they would need a way to store large amounts of solar energy for a long period of time for it to be practical. Perhaps another form of energy would be more practical after hitting a certain northerly point. In the end, solar may or may not be our best solution. I don’t really know. But right now, it seems like a very a good one that is talked about a lot, but implemented far less often. We have the technology now. We just don’t have the investment in it, or the drive to make it happen. This is what needs to change to make it feasible. Edit: Someone on Reddit pointed out that I failed to consider corporate use of power, as well as the fleets of automobiles we have throughout the country. To be clear, this piece is only about cutting our consumption of fossil fuels in regards to producing electricity. As such, dealing with the auto issues is beyond the scope of this piece. Though it is true if we switch to electric powered cars, this is also an issue we’d have to deal with. However, the point about corporate use of electricity is very true, and it very much slipped my mind. Taking automobiles out of the picture, $67 trillion would be very high, but the figure of $3 trillion I proposed would be too low. Also, bear in mind I wasn’t talking about completely replacing other forms of energy, but cutting down on the necessity of using them to maintain our standard of living. Basically, using none would be awesome, but using less is still very good. My revised idea for dealing with that is this: let corporations make the first big investment in solar energy. Perhaps provide incentives to them for doing so, though honestly, I think it would be in the best interests of a corporation to make this investment without incentives. Obviously, it would cost more for a corporation to make the switch than a homeowner, as they have a lot more energy they need to produce. However, they would also see a faster return on their investment since they use so much more energy. Still, many corporations have the money to spend up front, though it would certainly effect the bottom line. Perhaps showing them the way it could benefit the company long term would be enough to get them to begin investing. This initial investment would let corporations produce cleaner energy, and it would provide funds for research into more efficient solar power at the same time. More efficient solar power would mean reduced costs for those in the residential sector, as well as for any upgrades in the corporate sector. As the price comes down, more people could afford to invest in it, and it could spread more easily. 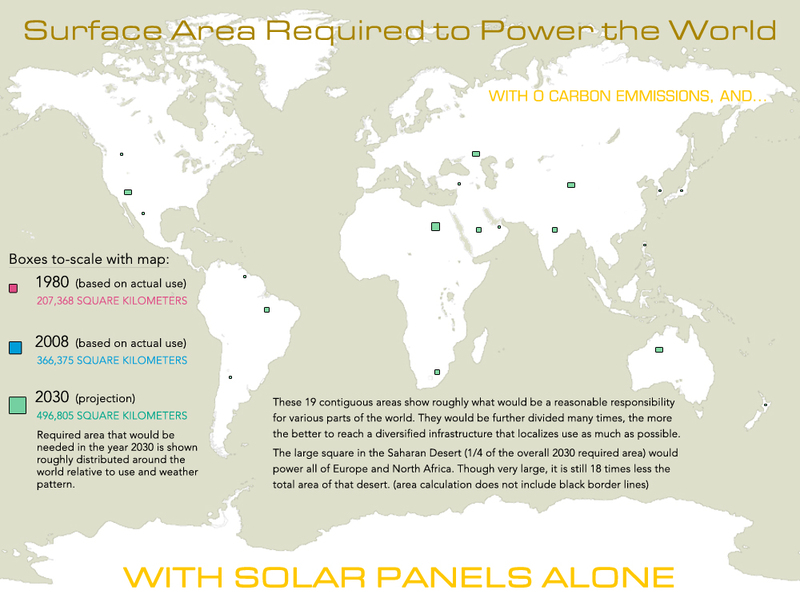 Edit 6/8/2010: Also, here’s an image about how much solar panel coverage we would need to power the entire world using just solar panels. Yes, it’s a lot, but it’s probably not as much as you expect.